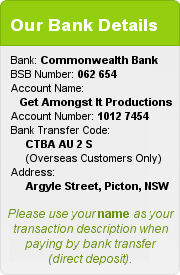 There will definitely be no regret at owning this latest BLOOM BROTHERS DVD, as once again they have delivered the goods with this well filmed top quality production that has AMAZING ATTENTION TO DETAIL. 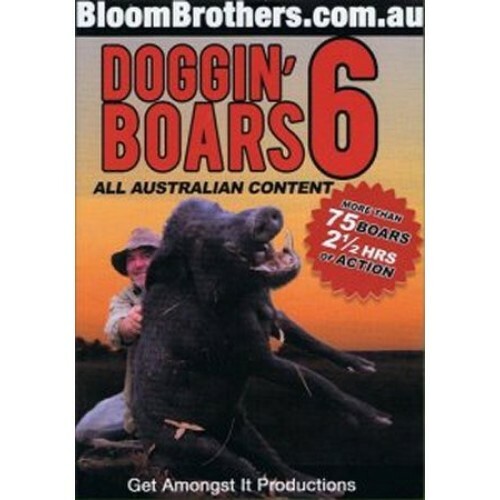 Over 2½ hours of well filmed action and excitement as the Bloom Brothers and friends run down and catch over 75 BIG FERAL BOARS with a mixture of gutsy pig dogs. Heaps of new country and boars to see from DESERTS to RAINFORESTS, SOUTHERN NSW to TROPICAL FAR NORTH QLD. You will also see Jim's snake collection with, some real 'Big Guns' of the reptile world. Then join in on a wild'n'rough scrub bashin' adventure with a veteran BULL CATCHER from the cape as he pits himself against over 20 DEADLY SCRUB BULLS, captured live. Be amazed as the skill of the AUSSIE WORKING DOG, as they yard cattle. Plenty of ONE OUT big hit ups on rough boars. 2 very CLOSE CALLS as the Bloom Brothers are saved by Tige and Frog. CHOPPER HUNTING WITH DOGS ON BOARD - Cape York - Stubble - Rubber Vine - Creek Bed - Gulf - Channel Country - Swamp Hunting - Big Sandy River Boars - Cape Crocs - 8ft long taipans and much more.